Concession Stand: Ticket Booth The little brother to Safari’s Concession stands, our Ticket Booths incorporate all of the same materials, just in a smaller square-roofed package. This is one of Safari’s smaller kits, and, as its name suggests is perfect for ticketing, although it is also used for trade shows, information hubs, greeting stations, and much more. 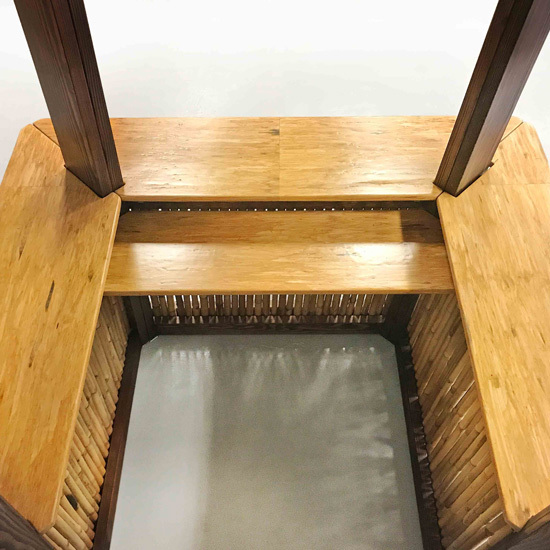 Appearance: Standard option includes solid bamboo facade, GRASSBuilt engineered bamboo counters, Douglas Clear Fir timber framing stained mahogany and sealed with urethane, plywood roof with woven bamboo plywood ceiling, peel & stick waterproof roof membrane, and 20-year artificial reed-style thatch roof. 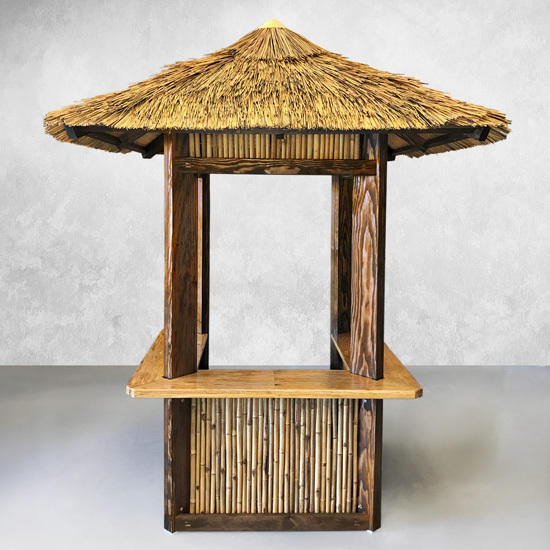 Fire Protection: All of our thatched options offer a full range of fire ratings. 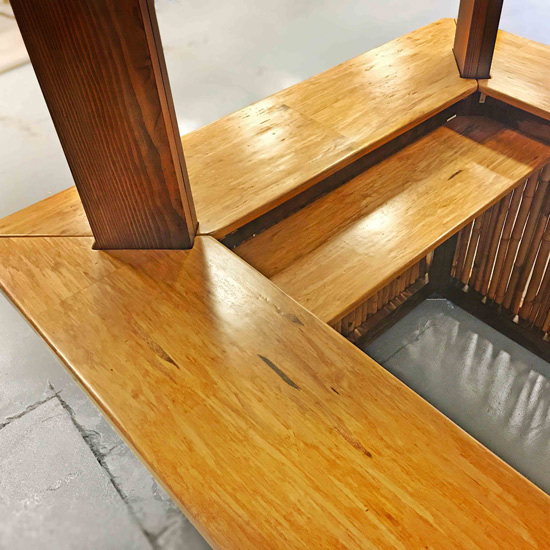 Durability: The structure is designed to last decades, but does require normal maintenance required for wood used outdoors, such as reapplications of Urethane coatings. Regarding thatch, our synthetic Viro Reed comes with a 20-year limited warranty. Size: 4′ wide base, 5′ wide counters, 8′ square roof, and standing approximately 9′ tall. Ease of Installation: While this is a smaller build, you will require a minimum of 4 people to lift the frame onto the structure. The roof is fully dried-in, and normally comes with the thatch already installed. This creates a heavy roof, and while it *can* be lifted into place manually, there is a hook provided on the roof from which it can be lifted into place mechanically. Complete installation instructions are available on request. 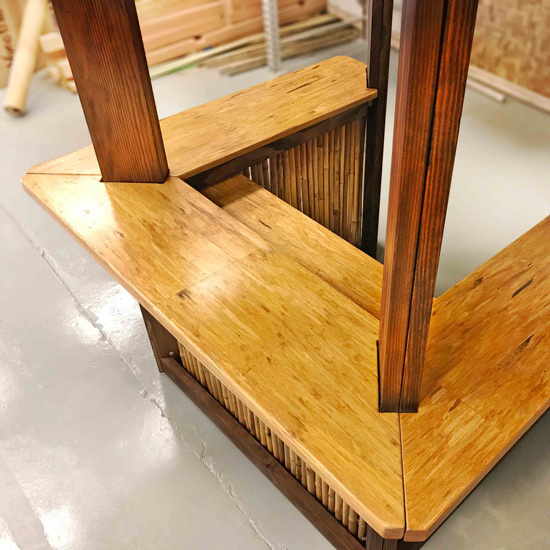 As the structure is almost completely finished when it arrives, assembly time is very quick. Secure the roof, and it’s ready! 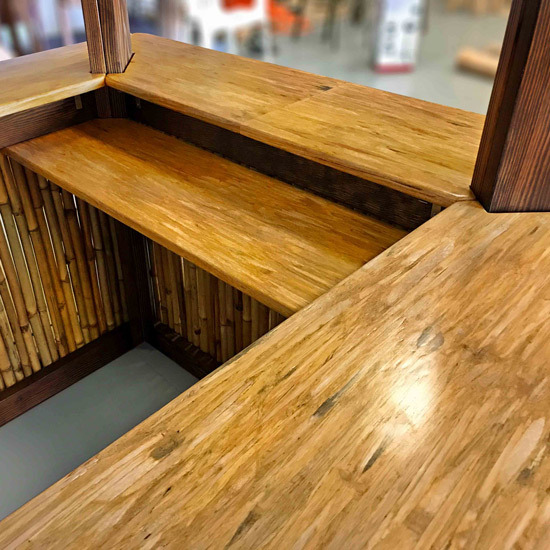 Materials: Clear Douglas Fir (or equivalent), Rolled bamboo Screen, GRASSBuilt engineered bamboo counters, marine plywood roof, peel & stick waterproof membrane, bamboo plywood veneer, and Synthetic Viro Reed.